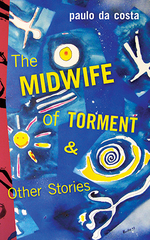 The Midwife of Torment & Other Stories is a collection of sudden fiction that compresses its narrative to deliver a variety of stories that alternate the flavour of a philosophical reflection with the whimsical enchantment of a fable with a twist. These stories also often dwell on the strange–and the horror–found in our mundane lives. Stories that, on occasion, also leap as far as speculative fiction or swirl in a lyrical exploration of prose narratives. Divided into six sections, Midwife explores human and non-human voices through narrative weighing at less than one thousand words, and the vast majority weighing at less than five hundred. Included are a series of black and white lithograph-like original drawings commissioned specifically for this manuscript from the Portuguese visual artist, João Ventura. Praise for Scent of a Lie: Paying homage to a fabulist tradition running from Marquez and Borges and Carlos Fuentes all the way back to Cervantes, da costa evokes his God-beset, earthbound peasants, priests and villagers with palpable, redolent precision. Praise for Scent of a Lie: da costa builds his fictional world with infinite patience and skill. Every line, every word takes the reader directly into the lives and homes of the extraordinary people of these villages.